Chord Wheel is an interactive circle of 5ths that works on Android. It's not an ordinary circle of 5ths. Chord Wheel is a software program reinterpreted the circle of 5ths which is one of the most important music theory. This is a well-known design of a circle of 5ths. 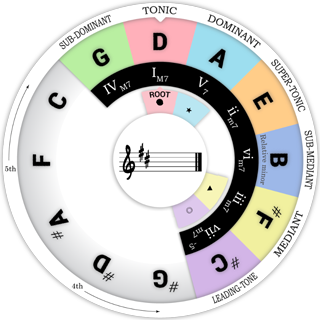 'Chord Wheel' is newly designed to show the correlation between the scale and the chord. Also, it has every information that can be get from a normal circle of 5ths. 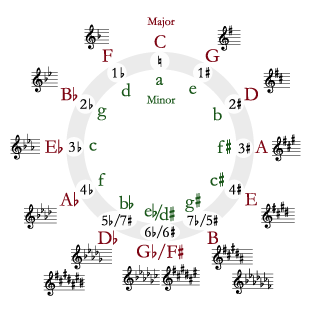 Circle of 5ths is a progression of keys and the keys can be layouted in two directions. 'Chord Wheel' supports both of the 2 directions. So, users can set the circle's direction to a dominant motion in CW or CCW. A default direction of the circle is displaying a dominant motion, a flow of vi-ii-V-I in CW, cause it looks more clear and obvious than the other. Inner wheel is switchable depending on user's purpose. Following types of note naming system are available in Chord Wheel. In Chord Wheel, scales are displayed on a outer wheel. 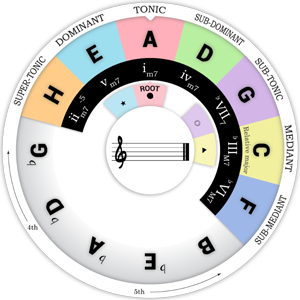 All scales covered on western music theory are included. Following scale types are available. Please understand that Chord Wheel is an app on the western music theory (classical / jazz), not a scale / chord dictionary. In Chord Wheel, chords are displayed on a inner wheel. Every chords related to the scales above are included. Following chord types are available. 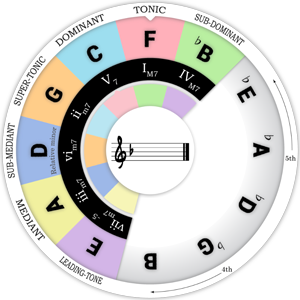 In Chord Wheel, modes are displayed on a inner wheel. Every modes related to the scales above are included. Following mode types are available.